Korean manuscripts : the end of inalienability ? The decision made by Nicolas Sarkozy during his trip to Seoul for the G20 summit will have far reaching consequences for national heritage, adding to those already endangering it. Many of us had suspected as much but Vincent Noce’s revelations in Libération on 18 November 2010, accompanied by a text protesting the move and signed by several curators at the Bibliothèque nationale de France, confirms it beyond a doubt : the restitution of the Korean manuscripts by Nicolas Sarkozy, a political and diplomatic act, is in fact, totally illegal. Some are already congratulating themselves for France’s so-called generosity without understanding the ins and outs of this affair. In an opinion expressed in Le Monde on 17 November 2010, two university presidents and Jack Lang write that these manuscripts “constitute a unique and essential historical record for Korea”. The curators at the BnF categorically deny this affirmation : “there are other copies of most of these in Korea”. Discussions were held with the Bibliothèque nationale, and there were other solutions, quoted by the curators (exchanges, alternating or rotating loans, …). Vincent Noce tells us that an agreement was reached in 2000 but was never applied because of Korea, and that contrary to Jack Lang’s claim, François Mitterand (who created a troublesome precedent by returning a manuscript) had never promised to return the rest. A lie is not a good start when trying to teach others a lesson. 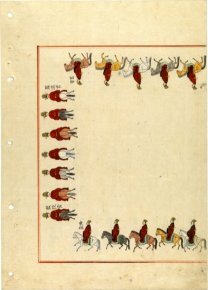 Even if these manuscripts were unique, there is no French or international law today authorizing their return to Korea. This affair has gone far beyond the problem of the objects themselves. By authorizing this restitution, the president of the French Republic once again strikes a direct blow to the principle of inalienability of French public collections. In which case, the law is no longer needed, the president’s will alone decides. There is also the added matter of the blatant hypocrisy involved as, officially, the deposit is for a duration of five years, on a renewable basis but everyone knows that the Koreans have no intention of giving them up and that the French government does not even pretend to believe it anyway. Le Monde, in an article by Michel Guerrin and Arnaud Leparmantier, quotes a source at the Elysées palace as saying : “Some manuscripts will return to France regularly, notably for the exchange of cultural seasons in both countries, in 2015 and 2016, celebrating the 130th anniversary of the establishment of our diplomatic relations.” The statement shows unambiguously that this deposit is in fact a simple donation, that of inalienable works from French collections. In the future, we will see more demands for restitution, often with no legitimate basis, and it will be very difficult to overlook this precedent. As the curators so wisely point out : “This decision reflects the increasing and worrisome subordination of heritage policy and law – at the risk of bringing into question the inalienability of public collections – to political, economic or geostrategic considerations.” This is precisely what we have so often denounced on this site. The curators at the BnF have launched a petition open to all and have the support of their superiors, an act which deserves to be commended as it takes a good deal of courage for civil servants to come out openly and express their opinion against a decision emanating from the president of the Republic. But is he really above the law ?